Artificial food coloring is used to make certain food and beverages look more appealing -- regardless if it is healthy or not. Some Americans are more likely to pick up a food item off the grocery store’s shelf if it is represented in a colorful rather than a bland way. Could this situation possibly be the same for live animals? For over 45 years, dyeing animals has been against the law in Florida. However, a recent bill was passed in the Florida Legislature that would lift this ban. On a whim, pet store customers might not stop to consider the responsibility of caring for these animals long term. 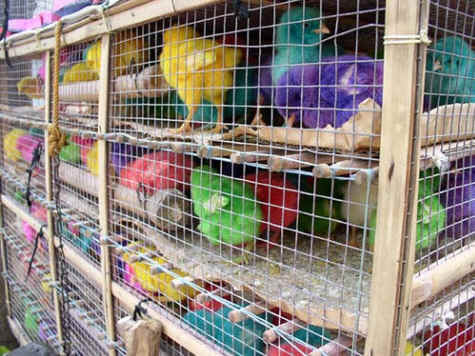 Since these colorful animals are usually purchased on impulse to please children and impress relatives on Easter, the dyed chicks, ducklings and baby rabbits often end up abandoned, neglected or dropped off at overburdened animal shelters. The current Florida law prohibiting artificial coloring and sale of certain animals and fowls; construction (828.161) states: 1. It is unlawful for any person to dye or color artificially any animal or fowl, including but not limited to rabbits, baby chickens, and ducklings, or to bring any dyed or colored animal or fowl into this state. 2. It is unlawful for any person to sell, offer for sale, or give away as merchandising premiums, baby chickens, ducklings, or other fowl under four weeks of age or rabbits under two months of age to be used as pets, toys or retail premiums. 3. This section shall not be construed to apply to any animal or fowl, including but not limited to rabbits, baby chickens, and ducklings to be used or raised for agricultural purposes by persons with proper facilities to care for them or for poultry or livestock exhibitions. 4. Any person violating the provisions of this section shall, upon conviction, be guilty of a misdemeanor of the second degree, punishable as provided in s. 775.082 or s. 775.083. According to the Sun Sentinel, the consideration to overturn this prohibition is influenced by a dog groomer in Broward Country. Over the past two years, letters from the groomer were sent to state Sen. Ellyn Bogdanoff urging that Florida lift the ban so he could dye show dogs. “It's incredible to think that the hobby interests of a single pet groomer can be considered significant enough to overturn a 45-year-old statewide ban,” Gallegos said. “A law that was meant to protect the animals from potential neglect and abuse." President Barbara Wetzler along with the Board of Directors of the Society for the Prevention of Cruelty to Animals of Central Florida are opposed to the sale of “seasonal or holiday” animals. The SPCA’s position statement declares that many of these animals suffer and die due to starvation, improper food, cold, abuse, over-handling or neglect. The chicks and ducklings can either be injected with the dye as embryos into the incubating egg or sprayed directly on the hatchlings. Poultry farmers erroneously say it is harmless. “It’s a perversion of consumerism,” secretary of the University of Central Florida’s Body of Animal Rights Campaigners organization, Chelsea Leger said. “I feel as though this example makes a mockery of our entire state legislative process,” Gallegos said.